Scientists from the FOM Foundation and the Technical University Delft, working together at the Kavli Institute of Nanoscience, have succeeded in detecting and correcting errors during the storage of quantum states in a diamond. This is an important step towards protecting fragile quantum information long enough to realize a functioning quantum computer. The results were published online on February 2, 2014 in Nature Nanotechnology. Whereas a classical bit of information either takes on the value '0' or '1', quantum particles can be placed in superposition, meaning they can be either '0', '1' or '0' and '1' simultaneously. These quantum bits enable powerful new ways to process information. They are, however, also extremely vulnerable to errors, such as accidental flips from '0' to '1' or changes in the phase of a superposition. Even the tiniest of such errors continuously accumulate to inevitably erase the quantum information. It is therefore crucial to timely detect and correct errors. During classical computations errors can be detected and corrected by making redundant copies and comparing these copies at intermediate steps. At first glance such error correction seems impossible for quantum states. Quantum states cannot be faithfully copied and are irrevocably disturbed when measured. How can we know if an error occurred without ever knowing what the state actually is? The theoretical solution, found in the nineties, is based on entanglement. This is the counterintuitive phenomenon that quantum systems can become so strongly connected that they can no longer be described separately. By encoding the quantum state in an entangled state of multiple quantum bits it is possible to compare the states of the quantum bits to detect errors, without measuring or disturbing the encoded quantum state itself. Dr. Tim Taminiau and his colleagues, led by FOM workgroup leader prof.dr.ir. Ronald Hanson, have now experimentally realized an error correction protocol at room temperature. Previous demonstrations required extremely low temperatures and high vacuum. The team used electrons and nuclei in a diamond. 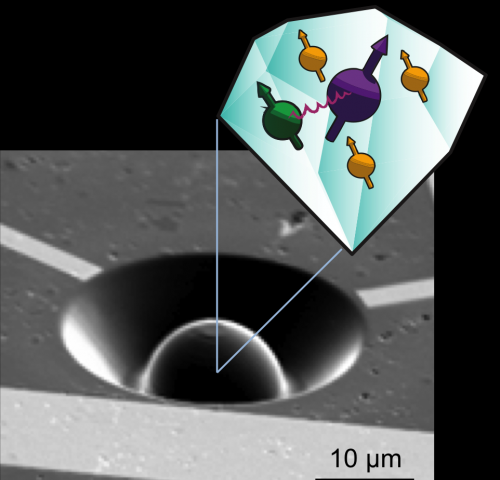 These particles carry an intrinsic property called spin, which behaves like a tiny magnet. The two possible orientations of the spin, up or down, form the values '0' and '1' of the quantum bit. The researchers entangled three of these quantum bits and could successfully detect and correct one type of quantum error at the time. The team now plans to demonstrate that quantum error correction can be used to simultaneously protect quantum states against all types of errors for an extended period. Such long-lived quantum information can enable fundamentally secure communication and extremely fast computations. This research was done in collaboration with researchers from the Ames Laboratory and Iowa state University in the United States.